A fabulous pencil sketch card showing many of the key London landmarks, incorporating The Shard at London Bridge Quarter, under the glow of the Christmas street lights. The street lamp, lights and Christmas tree have gold foil detailing, which adds sparkle. 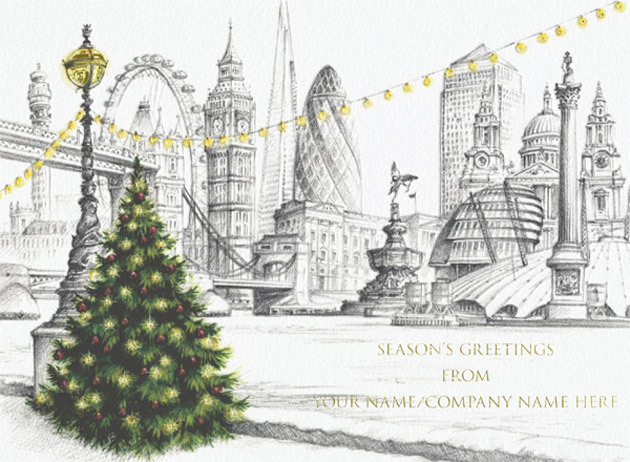 Personalise the front of this London scene design by adding your own greeting or message, and your family or company name, printed in gold foil, as shown. With embossing, gold foil detailing and printed on a beautiful white, textured board, this is a great card to send from the capital this Christmas. Card Finish: Embossed and Gold Foiled on a Textured Board. Add your choice of greeting and your family name or company name, printed in gold foil. By purchasing the Lights Across London - Front Personalised Christmas card 10p for each card you purchase will be Donated to the Charity of your choice from the Charities listed below.